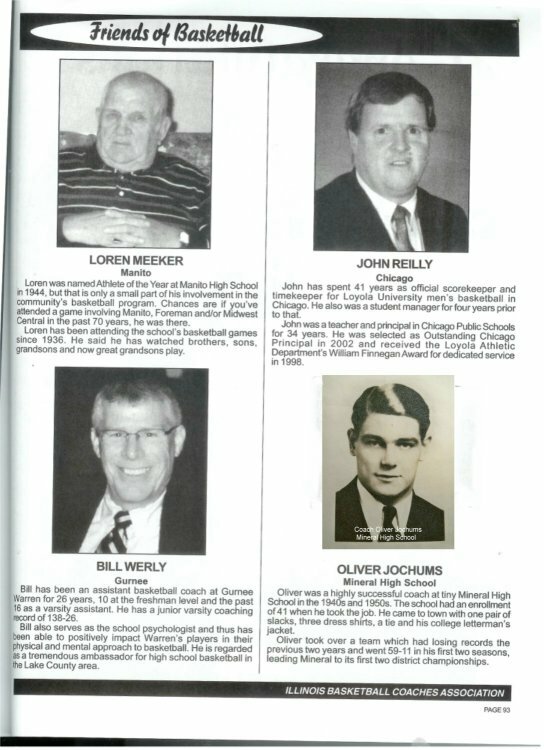 COACH OLIVER JOCHUMS ELECTED TO THE IBCA HALL OF FAME!! Before it closed in the spring of 1961, Mineral High School in western Bureau County had sported one of the premier smaller-school boys' basketball teams in this part of the state, particularly during a stretch from 1940 through to the early '50s. The school, which never had a student enrollment higher than 53 kids at any one time in its existence, won six district championships from '41 through '52, including back-to-back titles in 1941-42 and three straight crowns from 1950 to '52. Those six teams had a combined won-loss record of 146-44, highlighted by the Leopards' 30-5 finish in the '41-42 season, a 29-6 record the year before that, a 28-4 season in '46-47, and a 26-5 finish in '51-52. The 1941, '42, '47 and '52 teams were conference co-champions as well. When Mineral closed, it became part of the Annawan School District. Several prep athletes from Mineral and the surrounding area have done their part to contribute to the success of many of the Braves' athletic teams. For a school that has been silent for nearly 50 years, the Mineral Leopards continue to mark their mark on the area sports scene. Editor’s note: Dave Nanninga never attended Mineral High School, his hometown school was closed well before he was coming into high school age. But he gained a love for his hometown school, the boys who played for the Leopards and the coaches who coached them. One coach in particular, Oliver Jochums, has been of special interest to Nanninga. Jochums coached just 11 years at Mineral, but left a lasting mark. A mark that earned the late Jochums induction into the Illinois Basketball Coaches Association’s Hall of Fame as a Friend of Basketball. Nanninga and a group of Mineralites attended Saturday’s ceremonies in Normal. Nanninga offers a look at Jochums’ career and what he meant to the tiny town of Mineral. Coach Jochums was a true pillar of the Mineral community. He came to Mineral in the spring of 1940 when he heard of the opening for a coach and English teacher from a friend. At the time he had just graduated from Eureka College in Eureka and was working in a hatchery. He drove to Mineral for an interview for the job with his sister, Eunice. As Eunice told me in 2004, Mr. Jochums was a young man and quite nervous. He did not own a suit coat, so he wore a tie and his Eureka College lettermen’s jacket. He did not know how to teach English, so asked his sister what he should answer when the question was asked. She said, quite emphatically, “You tell them YES”. Coach did tell them yes, and was hired that day. She laughed when she told me of how he stayed up late for the next two years writing lesson plans for the next day’s English classes! Here are a few of the newspaper headlines found in scrapbooks of players from Mineral High School. The decades of the 1940s and 1950s were truly magical times for the boys basketball program at Mineral High School. The Leopards of these two decades had some incredible success and truly incredible records. Coach Oliver Jochum led the charge, becoming one of the most respected men in the community not only for his ability to coach, but also for his ability to teach and form young people into adults. Jochums’ first season at M.H.S. was one of his most successful in terms of wins and losses (29-6). This was accomplished with only 38 students (15 boys) in the entire school. His “First Team” consisted of three seniors, one junior, and one sophomore. His reserves came from two seniors, two juniors, three sophomores and two freshmen. This does not appear unusual until you consider that this was the TOTAL number of boys (14) in the entire high school! Well, actually there was one other boy but he chose to serve as the team manager. Coach Jochums was forced to juggle numbers like this throughout his eleven year stay at Mineral. 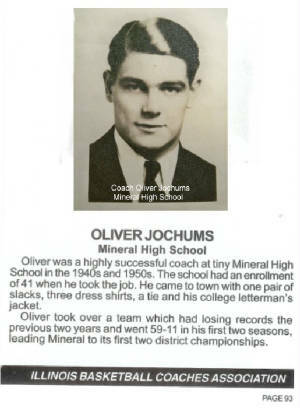 Coach Jochums’ overall record at Mineral was a highly respectable 212 wins and 106 losses - a .667 winning percentage. Only one year did he have the luxury of having five seniors on his “first” string (1952). The 1940-41 season also boasted five seniors however only three of them were starters. The remaining nine years had no more than 4 seniors (1953,54,55) and as few as one senior (1949, 1950, and 1951) on his roster. Coach Jochums did not let the numbers game effect his thinking or coaching ability. Coach actually seemed to thrive on the underdog roll he was hired into. What really made Jochums a step above other coaches was his ability to prepare for the State Tournament. During Coach’s 11-year stay at Mineral his teams appeared in eight District Championship games. Of the eight games, Mineral won six of them. Six District Championships in 11 years! In Bureau County only Ohio and DePue can boast similar records during that time. Coach Jochums sported an impressive post season record of 25 wins and 11 losses for a .696 winning percentage. Three of the District titles occurred in consecutive seasons from 1950 - 1952. If you speak to coaches and players of the “District Era” you will find a consensus that winning a District Title was very similar to winning a regional today. A District title set your team above those around you - i.e. those you competed against throughout the season. Coach Jochums was not one to scream and yell at his players in public. Most players remember the steely-eyed stare given by Jochums when they made a mistake. Coach mainly sat on the bench in John Wooden like fashion, addressing the team when he was able and point-blankly addressing the mistakes needing correction. Coach also held a review for his players each Monday. His team would sit on the stage in the gym and Coach would go to each one individually giving them “pointers” on how to improve. One story of Coach’s is remembered by his sister, Eunice Montgomery, as told to her by Coach. The Leopards were losing during Coach’s first year (1940-41) and were not playing up to their best ability. Coach was upset and entered the locker room at halftime after the team had sat down. Coach simply placed his foot on a bench and stood there, glaring at each player, moving from face to face. This went on for several moments without a word being said. Finally team captain Morris Foes could no longer take it. He simply said “Let’s go out and win one for Coach”. The Leopards ran onto the court and won the game by twenty points. Coach Jochum’s abilities were respected by his peers as well. After the Leopards’ hard fought loss to Kewanee in the Regional Championship in 1952 Coach was given one of the highest compliments he could receive from the assistant coach to one of the areas most well respected coaches, H.F. Brockman. Coach Landis was quoted in the Kewanee Star Courier as saying that Mineral was the most well coached small school team they had ever played against. When you have a small school you also have a small budget. Each faculty member had to contribute in as many ways as possible. Coach Jochums was no different. Not only did he coach the first and second teams at the high school level, he also coached the grade school “Little Leopards” basketball teams. He was also coach of the school’s short lived (three seasons) venture into football. He served as track coach (coaching several conference and county champions) and baseball coach during all of his eleven years at Mineral. On top of this he was a class sponsor, taught English and History classes, and even served as one of the school’s three bus drivers. Coach Jochums was a strict disciplinarian on and off the court. Coach had strict rules regarding diet, conditioning, and dating. Mickie DeFauw (’47) recalls a time when Coach took the team to his mother-in-law’s for dinner. Coach observed Mickie and one of the other guys eating ”homemade rolls”. Coach did not say a word about it until they returned to Mineral. He then took the boys into the gym to run laps so it wouldn’t stick! Other rules included no sweets, no pop, and no dating the night before a game. Violation of these rules resulted in disciplinary action. Palsy Rakestraw and Don Miller (’52) recalled a time when Coach caught the team’s star player, Bill Baird (’52), talking to his girlfriend after school instead of shooting baskets in the gym. He suspended Bill for the next night’s game against Tampico. Coach showed his human side when he inserted Bill with three minutes left in the game and Mineral trailing. The Leopards still lost the game but the message to Bill was clear. Coach was also very high on conditioning. Rigid calisthenics were a part of every practice. It is remembered by many of his students that his simply walking into a classroom brought a hush to the students without his speaking a word. Coach also liked to be a good role model and mentor for his students. He was remembered by Robert Studley (’46 - ‘48) to say that “many things can be taken from you, but a good education stays with you for life”. Bob used this as inspiration for he and those close to him as encouragement to further their educations beyond high school. Several alumni, both men and women alike, felt Mr. Jochum’s was an even better teacher than he was a coach. Coach’s initial stay at Mineral was interrupted in dramatic fashion. 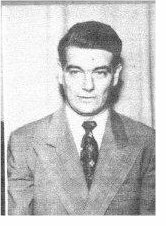 After his first two highly successful seasons at MHS (1940-41, 41-42) coach was called upon to service for his country in World War II. According to Coach’s sister, Eunice Montgomery of Riverside , Ca. (now deceased), Coach Jochums was assigned as a Military Police officer in the army and was within hours of boarding a ship for Japan in 1946 when his orders were recalled. Coach Jochums could have easily moved on to a bigger school with possibly better prospects of winning when his tour of duty finished however he called the superintendent of MHS to ask about the status of his job. There was no big surprise in that Coach was told his job was waiting for him. One alumnus, Sam Hodgett (’54) said he would never forget the sight of Coach Jochums walking up the sidewalk in uniform to the school in the fall of 1946. Sam was in 5th grade and this was something that sticks in his mind to this day. It is felt by many that had Coach been able to remain at MHS for the four seasons he missed he would have easily improved his and MHS’s winning percentages. Though he moved on from Mineral Coach always carried a sincere fondness for the people and time he spent at Mineral. Coach Jochums was a humble man and always talked about the great kids he had to work with at Mineral. He did not want the limelight on himself. He made a few treks back to Mineral from his home in Kalamazoo, Mi. Coach’s fondness was sincere when he said wished there were a two class system in Illinois when he was coaching at MHS. He really believed his teams could have advanced through several rounds.